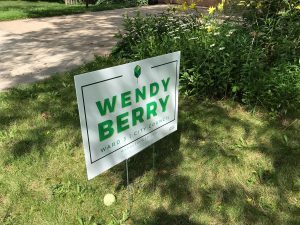 I’m supporting Wendy Berry for West St. Paul ward 3 city council in the Aug. 14, 2018 primary and, I hope, in the Nov. 6 general election. 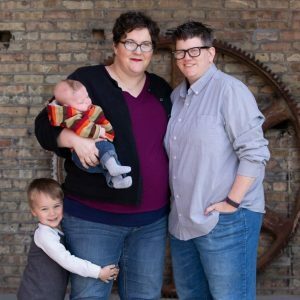 West St. Paul has four candidates running for the ward 3 city council seat, which means there will be a primary. Since city council is a non-partisan role, look for the city council race on the back side of your ballot. The top two in the primary will face off in the November general election. 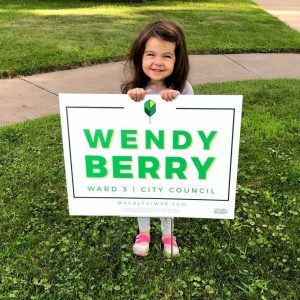 So why am I supporting Wendy Berry? A number of reasons. Luna with a Wendy Berry sign. My main reason for supporting Wendy has little to do with politics or city issues. I’ve gotten to know Wendy over the past few months, and I’ve been impressed by her positive and joyful attitude. She’s always upbeat, she’s always encouraging, she’s always ready to do some good. She’s faced some challenges this primary season, including the passing of her grandmother, her wife getting pneumonia, and a screw in her tire (OK, that last one doesn’t sound like much, but when it’s because of alleged retribution for speaking out against sexism in West St. Paul, that makes it a serious and scary issue). Yet Wendy is still engaged and positive, even in the face of adversity. I think that’s what West St. Paul needs right now. The sexism controversy in West St. Paul put a spotlight on the character of many in West St. Paul. Some, like council member Anthony Fernandez, couldn’t keep their story straight. Others, like former mayor (and current ward 3 candidate) David Meisinger, couldn’t help but step up their efforts to intimidate and harass others. But Wendy stepped up to make her city better. She decided to run for city council. Wendy had been considering a run before the city landed in the headlines, and that cemented her decision. We need leaders in West St. Paul who are willing to engage all of our citizens. Wendy can do that. We need leaders in West St. Paul who show up and respond. Wendy does that. We need leaders in West St. Paul who can bring positive energy and momentum to our challenges. Wendy is all about that. We need leaders in West St. Paul who see the big picture for our community. Wendy has that vision. In nearly every West St. Paul survey, parks and trails are listed as a priority. Wendy is committed to completing the River-to-River Greenway Trail and Robert Street tunnel. I think this is a huge project that won’t cost West St. Paul and is a major step toward linking our parks and connecting us to regional trails. Lower taxes don’t solve everything (just look at Kansas). Wendy understands the need for smart investment to help us tackle challenges like debt from the Robert Street project. We need to grow the tax base in West St. Paul, and that happens with investments such as Robert Street and Harmon Park that will bring people in. I’ve always been frustrated that it’s hard to know what’s going on with local elections. It’s why I blog about them. And that’s why I’m excited that Wendy Berry cares about engaging the community. She doesn’t just share an event on Facebook—she shows up. 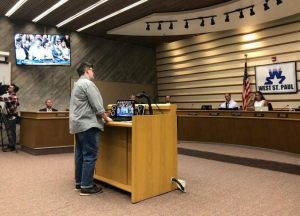 She’s supported sharing information in English and Spanish, as well as Pride flags on Robert Street—to cite just two efforts to include more people. This was a major issue in West St. Paul this spring, and it’s become clear it’s been an issue for a long time. This should be a no-brainer issue, but we’ve seen that’s not the case. We need a candidate who gets that. Wendy totally gets it, and she brings the experience of an HR professional to help our city better manage these issues and ensure we’re treating all people with respect. We have great emergency services in West St. Paul. We need to keep it that way. That happens when our elected officials are actively engaged. Long before running for office, Wendy went through the city’s Citizen Police Academy, which shows her proactive involvement and support. A lot of times it’s hard to know what city issues will come up during a council member’s four year term. It’s important to trust the person we vote for and know they’ll listen to us and make wise decisions. The way Wendy weighs her decisions and tries to be inclusive gives me great hope that she’ll be an incredible council person. I put up this Wendy Berry yard sign. I’ve done a lot of blogging about local politics. But let’s be honest: I haven’t done much more than that. Wendy Berry is the first local candidate who has inspired me to volunteer for their campaign. I think passion and energy are important. When it’s infectious and brings other people out, I think that’s huge. I’m excited to vote for Wendy. I hope you’ll join me. Check out her website, visit her Facebook page, see if she’s someone you can get excited about too. So who else is running? 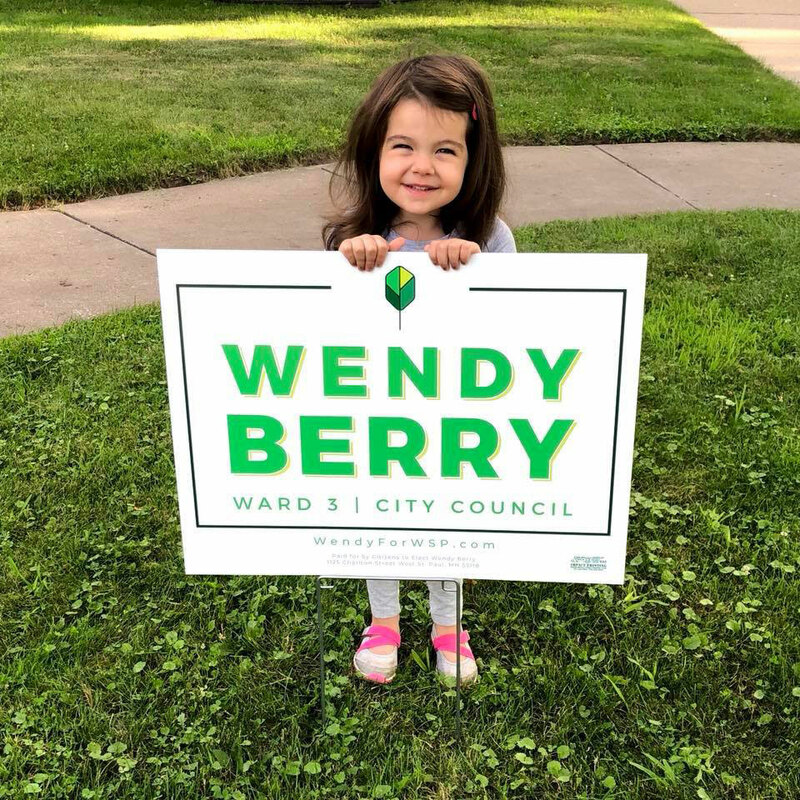 I think it’s important that voters make an informed choice, so while I think you should vote for Wendy Berry, I’d encourage you to check out the other candidates and make up your own mind. Lisa Eng-Sarne (campaign site) – I’ve seen good things from Eng-Sarne and I’ve got nothing against her. I’ve even written letters to the editor encouraging people to pick Wendy or Lisa. But I have to pick one candidate to vote for. Wendy’s energy and positive attitude in the face of adversity put her over the top for me. John Ramsay (campaign site) – I think he’s wrong on the issues (I wrote about his 2016 campaign against Dave Napier, and I think much of those criticisms still stand). But it’s hard to know because Ramsay won’t answer questions. As of this writing, his campaign page has only two posts that don’t offer any solutions. It’s like he doesn’t want to run. If you’re not invested, don’t waste our time. David Meisinger (no campaign site) – I’ve written about why David Meisinger should never hold public office again. Forget the policies, his bullying and intimidating behavior should never be tolerated. 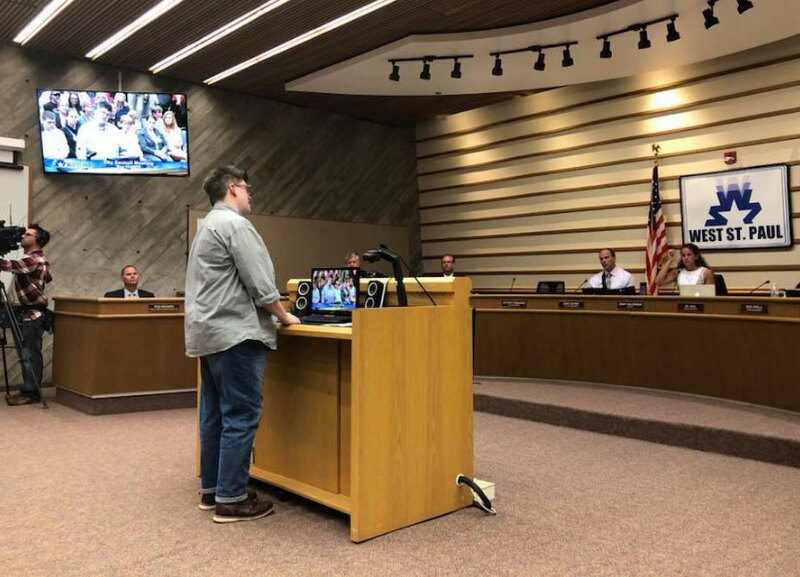 Wendy Berry addressing the West St. Paul city council on May 14, 2018. I want to be proud to live in West St. Paul. I want everyone in this room and everyone that calls this city home to be just as proud. And people want to do that by volunteering—they want to help improve our park systems and make sure we have the right zoning ordinances set up to help our city grow and find ways to make our city more sustainable. The thing is, nobody really knows how to get on these half-empty committees or commissions. Nobody knows the unwritten qualifications or rules that keep getting made up on the fly behind closed doors. People keep applying over and over, and yet spots still sit empty and nothing is getting done. So I’ve decided I’m going to do the only thing I know how to do to get involved where these hidden rules can’t get in the way: I’m going to run for city council. I’ll be at city hall first thing in the morning on May 22 with a $20 check in hand. I live in Ward 3, and council member Bellows, with your term expiring, I think the people that live here deserve someone that cares about what they think, understands what the word transparency means, and knows how to treat people with respect and dignity. This is something I’ve been considering for the last few months, but the events of the April 23 council meeting made it crystal clear that now is the time to step forward. The primary is August 14. The West St. Paul city website has details on where and how to vote, including a handy ward map in case you’re wondering if you live in ward 3. You can also vote early with an absentee ballot, either by mail or by stopping at the Dakota County offices. 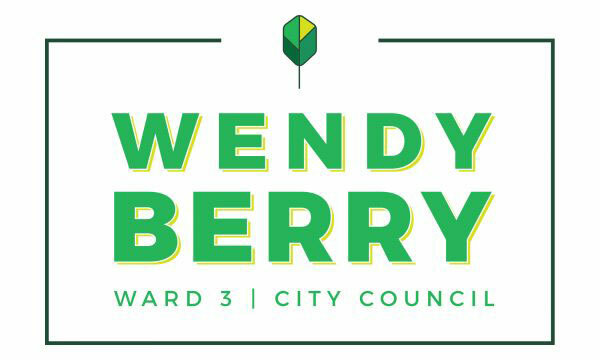 So join me in voting for Wendy Berry for Ward 3 city council.